We're getting ready to remodel and need to remove a 1950s kitchen of vintage Youngstown cabinets with chrome boomerang drawer pulls and cabinet handles. There are upper and lower cabinets and a corner lazy Susan unit. How can I find someone who would value these cabinets instead of putting them in the landfill? where, roughly, are you located? I am re-doing my old 50's kitchen and having cabinets restored. I need a few more cabinets. Do you still have some? I could use a couple of lower cabinet units and perhaps a drawer unit. If you have these items available, can you please let me know how much you're asking for them and whether or not you can arrange for shipping? We just moved into a 1920 farm house and the kitchen was redone in the 50's with youngstown kitchens by mullins. my husband and I have finally agreed to keep the cabinets ( because I love them!) but inorder to keep him happy we need more cabinet/countertop space. I hope it is not too late. Please let me know. I am currently removing a 1952 kitchen with Youngtown metal cabinets. There are two double door top and bottom cabinets and a top and bottom corner cabinet with lazy susans, an electric sink, a single pantry cabinet and cabinets for over a range and a refrigerator. I am in Northern New Jersey. I have some Youngstown Kitchen by Mullins cabinets in my home and I am lookning to complete the set. I am looking for a 30" wide base, do you have one and are you willing to sell separately? I will pay to ship. Saw your post. Perhaps this is of interest to you. 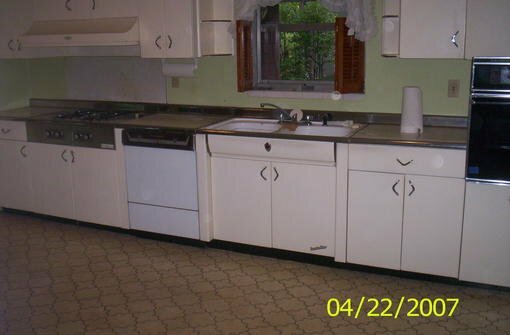 I am renovating a 1960 kitchen that has a complete set of Youngstown Tappan metal cabinets, with a Tappan electric cooktop and wall oven. Cabinets are a coppery brown color and mostly in good shape. Sink base even has the nameplate. Counter has chrome edge and white metal backsplash. The is also a cooktop, wall oven, and dishwasher, though I doubt they work. If you are interested or know of someone who might be, please advise ASAP. I have a complete set of Youngstown kitchen cabinets and I am getting ready to "update" my kitchen. If you are interested in any or all, please contact me. exactly what pieces do you have? I may be interested in the cabinets. Let me know where you are located and if you can provide some information about the size of the kitchen they're in. Do you still have them? If so, my specs are also on the web site. The following are the cabinets that I have. They were originally white and had been painted at least once. About four years ago, I had them stripped to bare metal and painted yellow, so there is currently only one coat of paint on them. The electric sink base was thrown out by my contractor. I am located in Bergen County, New Jersey. You can e-mail me at landlshop@optonline.net. If you like, I can probably take a couple of digital photos of the pieces, which are currently sitting in my garage. I'm in Birmingham, AL, just down the road. Do you still have those Youngstown cabinets? Need (1) handle [grandpa lost during repainting], (2) undersink cabinets or just the doors [rusted over the years and at least one hinge broke]. Also, would like to expand kitchen with upper and lower cabinets so could use entire kitchen if someone is remodeling. I have a sink and unit (one piece) by Youngstown. It is a white piece with a two under counter cabinet doors, four drawers to the right and a drawer and cabinet to the left. It is in good condition. I am in NY. 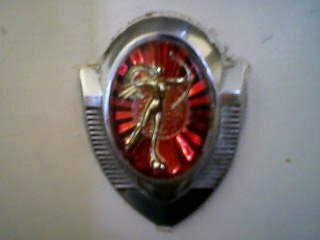 Any idea of what it is worth???? Hello. Saw your post about the Youngstown sink and cabinet unit. Are you selling it? If so, what would be the price? 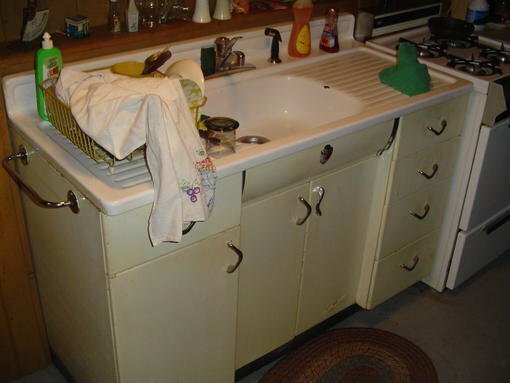 Am in PA and looking to replace Youngstown Kitchens by Mullins sink unit (double sink, drainer each side) which sits on top of two cabinets, 4 drawers to right and drawer/cabinet to left as you look at sink... Would appreciate any information. Thank you very much. We recently remodeled our kitchen. We have the sink you mentioned. We're located about 30 west of Akron,OH. There had been a chip in the procelain that I fixed about the size of a dime. It was repaired over 10 years ago with no problems. We also have other white Youngstown cabinets and a GE double oven/ 4 burner stove. I have all of what you are looking for and yes I am selling them. I am located in TN. Send me an email to reldredge3@yahoo.com and I will send you pictures and a price if you are still interested. Hi! I saw you were looking for the cabinets. I have a complete unit I am getting rid of in January. They have been well used but still have life and can be repaired were needed. I can take pics and email them if you want. First, the people before me painted them a beige so the fronts are not white. I do not know what it takes to restore. I have one 60" unit that has a double sink, two cabinets under and one to the left w/a top draw and four draws to the right. It all has a one piece sink counter/top. Then there is also three 18" cabinets w/top draws. Two together under one counter top and one on it's own. Then I also have four wall cabinets, two 24" and two 18" BUT one of the 24" doors is off. We have the door but it broke off. Hello, interested in the open shelf unit. Still have? Any chance of a picture? Price and where are you located. Thank you. I also have Youngstown Kitchen cabinets in Fairfield, CT that I would like to sell. See a photo and more detail in a separate message on this site. Hello, Are you still looking for cabinets? And or the sink? Just wondering if you ever found out how much the sink base and sink were. Are your Youngstown kitchen cabinets still available. I am looking for base cabinets, any combo up to 40 inches total. I still have the same inventory previously described. Do you still have the cabinets available? If so, do you have digital pictures you could e-mail me? Where are the cabinets located? Thank you. Yes, I am interested in buying the 36 in base cabinet. Could you please e-mail me a picture at cjolewis@hotmail.com. I find these postings so confusing so this may not apply to you, but our Fairfield, CT cabinets are available. See the following thread for a picture. We may not have the 40" base that you are looking for. You are right about the confusing threads here. I am looking for one base cabinet, but can be pretty much any size up to 40 inches. However, I live in Nevada and would need you to be willing to take to a local UPS store to have boxed and shipped (at my expense of course). So, to recap, am also looking for 18 or 24 in (approx sizes) base cabinet widths also. You can e-mail me directly at cjolewis@hotmail.com. Will be willing to travel to get these; I really need to get a Youngstown Dishwasher to complete the one that I have. Thanks! I just stumbled across your posts for the cabinets. Could you please email me at gcloys@charter.net about the status. I am interested in the range hood especially. I'm looking forward to hearing from you. Buyer will have to pick up. Feel free to e-mail with questions or for pictures of the sink. My e-mail is kenstaffey@yahoo.com. I'm sorry, but we decided to keep the kitchen intact so the cabinets and hood are not available. I am remodeling some cabinets i was able to get ahold of and the handles are in very bad shape. I am searching for at least 8 to 25 handles. They are a special size, 2 3/4 inches from top screwhold to bottom screwhole. Does anyone know where I can find any kind of handles with this size? The average handle for a wood cabinet is 3inches from top to bottom screwhole. You may reach me at vgulya@worldnet.att.net. Thank you for all you help~! can you email me the sizes and prices @ vgulya@worldnet.att.net? I live in Indiana and can call you after 7 PM or on a weekend on my cell phone. I'm selling my Youngstown kitchen cabinets: one sink base with sink, corner base cabinet with lazy susan, and double base cabinet with 2 doors and one upper drawer. Includes black & brown swirl countertop with chrome backsplash and chrome accents. I'm in Dallas, TX and this would be pickup only. Also, I have them listed on ebay. Hi, I saw your posting and wondered if you still want a Youngstown Tappan Kitchen. I just purchased a house in Birmingham and have an entire Kitchen that I am looking to remodel. The previous owner of the house was the builder and only one who lived in the house. The kitchen is original and in pristine condition. Everyone thinks I should keep it but I am not really looking to keep the retro look. 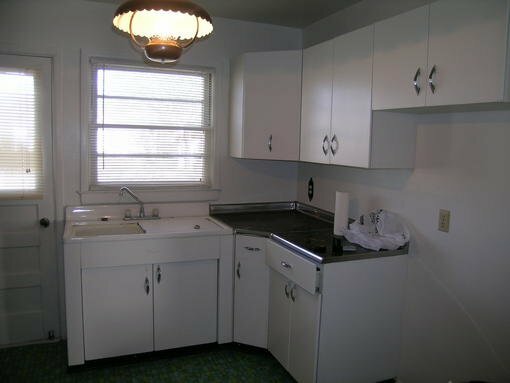 The cabinets are white with silver handles and includes the Youngstown Gas Stove and Sink. Please let me know if you are still looking or interested. Do you still have your cabinets available? I would be very interested in learning more about them. Sizes, etc. 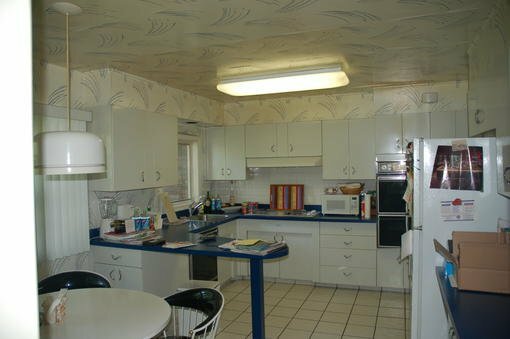 Hi, we have a 1957 bungalow with yellow youngstown metal cabinets. Our Tappan oven recently died and we are looking to put in a new oven but need bigger cabinets(Tappan was a 24"). Any chance you still have the 30" set left? If not, do you have any info or contacts? Would appreciate any information. Do you still have any pieces remaining? Could you send me the measurements? Thanks. I recently acquired a property which has metal Youngstown kitchen cabinets. Many cabinets have handles missing and I have been unable to locate any type of handle to use as a replacement with the same spacing between mounting holes as the original handles. Does anyone know of a source where I can find handles that would fit the existing mounting holes? They don't have to match - I would consider replacing all of the handles with new ones if I can find a replacement that fits. I am purchasing an old house in Birmingham with a Youngstown Kitchen in the peachy color. I need a new sink unit, width 48". Do you have one? Thanks. I could use this sink if still available please contact me at mdaniell7@hotmail.com. Thanks! I need a 48" sink unit preferably in peachy-brown color, but white would work, I think. Do you have one? Thanks. I could use a 48" sink unit especially coppery brown for a kitchen in an old house we are buying. Do you have one? I have a Youngstown kitchen for sale. 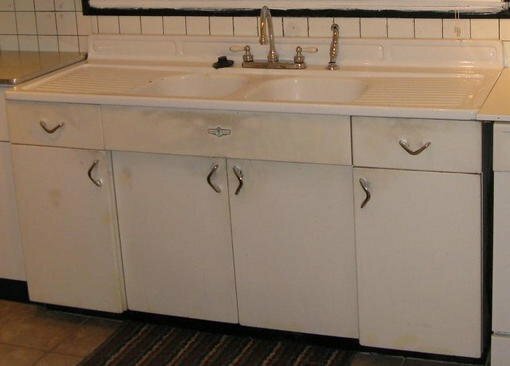 It is dated from 1951 and includes upper and lower cabinets as well as the sink base and Roper Stove/oven. If anyon is interested, please reply. Am interested. Where are you? I am located in Ohio. I am in need of an 8 ft. section. Upper and lower. 'Boomerang' handles. Would be willing to pay to ship. What is the width of the sink unit? I'm interested. Do you have a 48" sink base unit? I have approx. 10 ft of lowers 7 feet of uppers and 2 tall pantry cabinets all in great shape (paint to your needs)sink cabinet included in above cabs. Poor: Major rust on cabinet base (Toe kick) and moderate on exterior and interior of cabinet and drawers. Base may not be usable. If used base will require re-painting/ re-finishing. Good to Very good. Built-in drain boards on either side of sink. 3-hole faucet plus sprayer hole. Scratches in porcelain, majority in sink tub. 1 chip on corner. Asking $250 or best offer. Here is my prior posting. Is this what you were referring to? Could you send me some pics at jdd_lou@yahoo.com? I have several cabinets that I am willing to sell as a set or separately. Good condition, just minimal wear and tear, and very little rust. Only painted once, current color ivory. I have the attached in Des Moines, IA what's the utility of these? see attached if that works? I am looking to complete a kitchen set that I have. Still looking for available Youngstown cabinets. Do you have any left or know of any? do you have a youngstown porcelain sink top with drainboard? I still have the inventory listed in my January '08 posting, except the pantry cabinet. I'm looking for a Tappan wall oven for the youngstown kitchen. Will this fit into an opening approx. 21 3/4" x 24"? so I don't think your email is spam. I have cash! Thanks! sorry, i want to complete my set too. I am looking for the porcelain sink/counter top. I have a 66" sink base and sink available. The base is in pretty good shape (no rust). The sink has a few chips and should probably be resurfaced. Are you still selling the metal kitchen cabinets? Please let me know. Anyone looking for an entire kitchen of uppers and lowers and range hood. No sink, no dishwasher, no stove, no range. Just cabinets. With boomerang handles. I don't think they have been painted, but I wouldn't swear to it. They are in great condition and are a pumice or putty color (no dents or scratches on the faces). The range cabinet still has the emblem. The insides are in near pristine condition. There are even more cabinets than are in the photos. And how much do you want? Terms would have to be worked out in terms of pricing and delivery. You can email me at themssfitz@yahoo.com. Thanks for asking. I have a sink base (54K-39356) with a old single basin sink. It is 54" wide. Anyone who is interested, maverick.16830@verizon.net before it goes to the scrap yard. s the set posted on bobvila still avialable and if it is how much is it? 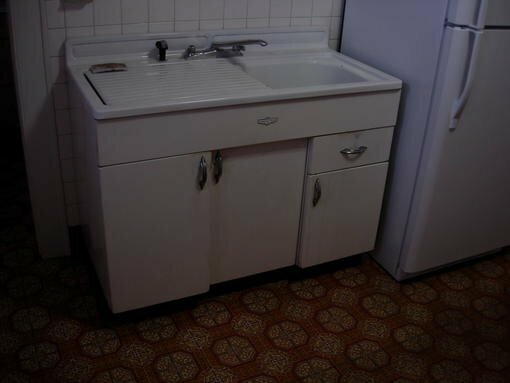 I just bought a home w/ full 1953 complete youngstown kitchen and double sink. Original paint. No dents all tags and emblems are perfect. Any takers? If not i will paint and keep. We have a full set of steel kitchen cabinets with a double farmhouse sink. They are in excellent condition as they have been operational in our summer home. We are only interested in selling because we are doing a full kitchen remodel. The exterior doors and drawers were professionally painted a few years ago. Picture is below if anyone is interested! 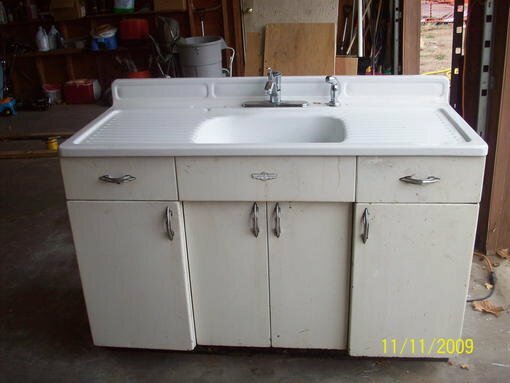 HI, IS THIS SINK & CABINETS STILL AVAILABLE AND IF SO HOW MUCH? I am looking for 14 boomerang cabinet pulls. Does anyone have any to sell? Just purchased a turn of the Century House, selling a 1947 Youngstown Porcelain enameled top and metal base, both are in very good condition (considering their age), the drawers had been lined since first purchased and it was taken good care of, there is some rust damage on the right exterior side wall (no issue if install not on an edge) and some minor chipping in two locations on sink top. Posting on Craigslist and eBay, but saw extensive inquiries here so I thought Id place a post, would prefer local pickup (Newtown PA) about an hour from Philly NY or central NJ.... Please inquire if you are interested, will be taking more photographs tomorrow! Asking $550 of best offer! I have a full set of cabinets to sell. Bucks County, Pa if you're interested. $750 for entire set! I also have a yorkstown kitchen set, farmhouse sink same w bade cabinets same as above picture, a lower base cabinet w forest green Formica top and chrome trim, and 3 upper cabinets. All have original pulls. Unsure if original finish or painted white. 700$ for all. Located in Colorado but can ship. Email me at pdchavez3@msn.com for more info, or to purchase. No other solicitations please. 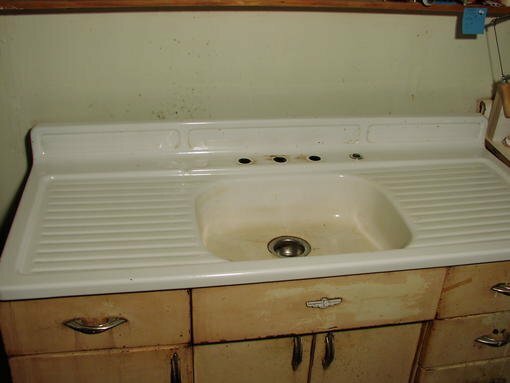 Also wanting to sell our Youngstown kitchen single farm house sink and 4 cabinet door 2 drawer base.. good condition cannot upload picture here but can email if interested.we bought a house built in 1900 wanting to remodel.Thanks. Youngstown kitchen cabinets and frigidaire flair double oven for sale here!